Obama Unveils 'New Approach' On Cuba As Former Foes Chart New Course : The Two-Way The U.S. and Cuba will start talks on normalizing relations and discuss opening a U.S. Embassy in Havana. Also today, Cuba freed USAID contractor Alan Gross on humanitarian grounds. 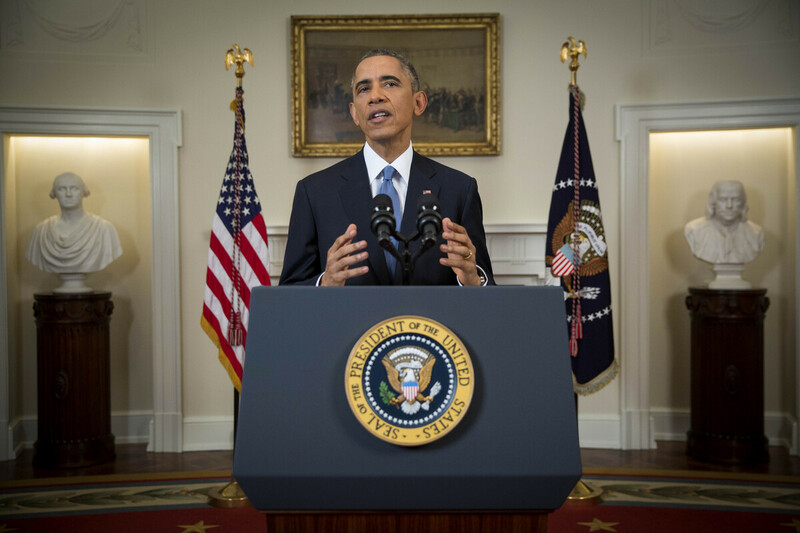 President Obama announced Wednesday that the U.S. will work with Cuba to normalize diplomatic ties. President Obama announced today the most significant change in U.S. policy toward Cuba in more than 50 years, paving the way for the normalization of relations and the opening of a U.S. Embassy in Havana. Obama said "we will end an outdated approach that for decades has failed to advance our interests and instead we will begin to normalize relations between our two countries." He added: "These 50 years have shown, isolation has not worked. It's time for a new approach." Obama said as these changes unfold, he will talk to Congress about lifting the embargo on Cuba. The U.S. severed diplomatic relations with Cuba in 1961, shortly after Fidel Castro and his communist rebels ousted dictator Fulgencio Batista. In a nationally televised address that coincided with Obama's remarks, Cuban President Raul Castro called on the United States to "remove any obstacles that hinder ties between our two countries." "This decision by President Obama deserves the respect and recognition of our people," Castro said. However, he added, this "does not mean that the most important issue has been resolved. The embargo on our country ... has to end." Despite "profound differences," Castro said, Cuba is willing to talk to the United States about thorny subjects including human rights and democracy. Today's developments come hours after news emerged that Alan Gross, the American contractor who spent five years in a Cuban jail, had been freed on humanitarian grounds. 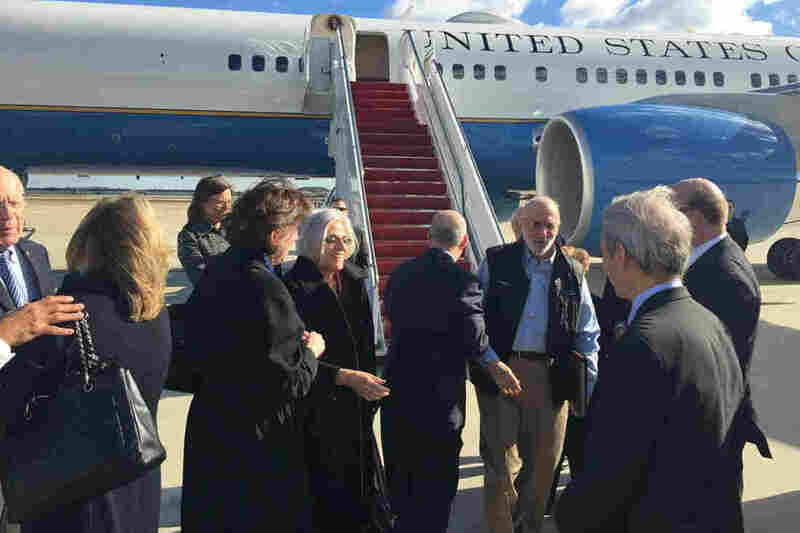 "It's good to be home," Gross said in Washington, shortly after his return to the U.S.
Alan Gross (third from right) disembarks with his wife, Judy (fourth from left), from a U.S. government plane at Joint Base Andrews in Maryland. U.S. officials also said three Cuban spies, part of the so-called Cuban Five spy ring, will be released in exchange for an unnamed U.S. intelligence asset jailed in Cuba for nearly 20 years. That individual, U.S. officials said, identified the Cuban Five, Cuban intelligence agents in the U.S. who were caught in the 1990s. He also identified former Defense Intelligence Agency analyst Ana Belen Montes and former State Department official Kendall Myers and his wife, Gwendolyn, as Cuban agents. Castro, in his news conference, said the man was a Cuban national. U.S. officials said the two countries will also normalize banking and trade relations. They said the U.S. expects to have differences with Cuba on issues such as democracy and human rights, but the move toward normalization is a "better way of advancing our interests and our values." Obama, the officials said, approved high-level talks with Cuba over the spring, and meetings were held in Canada. The Vatican also played an important role, the officials said, with Pope Francis appealing for Gross' release in letters to both leaders. The officials said the U.S. will also move to remove Cuba from the list of state sponsors of terrorism. Cuba has been on the list since 1982. Obama has asked Secretary of State John Kerry to give him within six months a review of Cuba's support for terrorism. Officials said that, among other steps, the U.S. will ease travel and remittance policies; expand commercial sales and exports; and ease imports, including of tobacco products and alcohol. The U.S. will expand Cubans' access to the Internet and telecommunications. The U.S. and Cuba will both participate in the Summit of the Americas in Panama next year, but the U.S. said "Cuban civil society must be allowed to participate." Separately, Cuba also agreed to release 53 detainees whom the U.S. regards as political prisoners. As we previously reported, Gross, a subcontractor for the U.S. Agency for International Development, had been working on a program to improve Internet access for Jewish Cubans. During several trips to Cuba he had covertly distributed laptops. A Cuban court found him guilty of crimes against the state in 2011, and sentenced him to 15 years in prison. In December 2013, Peter Wallsten of The Washington Post told NPR Gross was being detained in a 10-by-12-foot room with two other prisoners. This month, Gross' wife, Judy, said her husband had lost more than 100 pounds during his detention. "He can barely walk due to chronic pain, and he has lost five teeth and much of the sight in his right eye," she said in a statement. In an interview in June with NPR, Judy Gross said her husband was "despondent and very hopeless." She warned that he had said he would "take drastic measures if he's not out very shortly." Gross had staged a nine-day hunger strike earlier this year. Sen. Marco Rubio, R-Fla., welcomed Gross' release, but told Fox News, "I'm not in favor of the process by which his release was acquired, because I think it does set a very dangerous precedent." He noted that Obama's expected announcement will do "nothing" to further democracy in Cuba. "It's part of a long record of coddling dictators, and tyrants, that this administration has established," he said. The steps announced today are likely to be closely watched in Miami, which is home to a large Cuban-American community. As NPR's Eyder Peralta notes: "The assumption is that Cuban-Americans support punitive policies against Havana, but over the years, polls show that attitude has changed significantly, even among older emigres." Most Cuban-Americans oppose the embargo. Foreign policy experts welcomed the U.S. move. Christopher Sabatini, a professor at Columbia University's School of International and Public Affairs, called the move "profound." Michael Desch, a professor of political science at the University of Notre Dame, called it a "long overdue step." "We have resisted normalizing relations with Cuba to this point largely because of the domestic Cuban-American lobby which has held that normalization would bolster the Castro regime," he said. "That logic is flawed: The more Cubans are exposed to American culture, politics, and our economy, the weaker the hold of the Castroites on power."